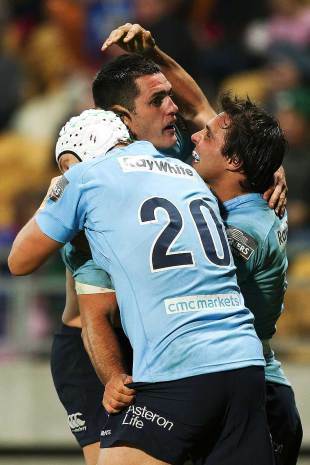 New South Wales Waratahs made a strong statement of their Super Rugby title credentials against the Chiefs in New Plymouth on Saturday, scoring two converted tries in the final 10 minutes to secure victory after a strong fightback from the two-time defending champions. The Waratahs laid the foundations for victory with a strong performance in the first half, dominating the ruck and effecting a swift defensive line to produce turnovers while also proving more threatening with ball in hand - making double the number of clean breaks as the hosts missed 12 tackles. The hosts, in coach Dave Rennie's words, were lucky to trail only by 10 points at the interval, but they improved markedly after the break to be more damaging in the loose and more threatening with ball in hand; they scored two converted tries from Bundee Aki within minutes of his entry to claim the lead, the replacement midfielder diving on kicks in behind the rushing defensive line, and they looked set for victory as the visitors seemed to be tiring. But the Waratahs refused to wilt. "Polota-Nau lost his two front teeth at the start of the game and punched his way through until the end, and that's the type of thing I really like to see in a team. We just stuck to our guns and got the result. And against a team like the Chiefs that's a really rewarding outcome for us. Michael Cheika hails the heart and spirit of his Waratahs. Bernard Foley kicked a penalty goal with 13 minutes to play to regain the lead, and it was an advantage the Waratahs would not relinquish. New South Wales ensured they played the game in the Chiefs' half thereafter, and they secured the victory with a try from Dave Dennis - the captain palming Pauliasi Manu away when given the ball one-out from a ruck before sprinting 30 metres and diving across the whitewash. The Tahs then iced the victory with a try from Foley after a succession of driving mauls deep in Chiefs territory. Foley then landed a sideline conversion to complete his six-from-six return with the boot in a performance that will surely boost his Wallabies selection chances. He thrived behind the physicality of the Waratahs pack, and he was a key link for dangerous runners such as centre Adam Ashley-Cooper and Israel Folau. Ashley-Cooper was also outstanding, and his sizzling break in the 15th minute sent Folau across for the fullback's 11th try of the season - a Waratahs record. Dennis acknowledged the Waratahs had got a monkey off their back with victory in New Zealand after eight consecutive defeats since their last previous win across the Ditch - against the Chiefs in Hamilton. "It's been a couple of years since we had a win over here, but we were really keen to put in a strong performance tonight and we're really pleased with the result," Dennis said. "They're a consistent team [and] we knew they'd keep fighting for the full 80, [but] I thought we stuck to our game well. Our discipline was probably a bit off there but we kept playing, we kept attacking with ball in hand, and we got some good tries in the end." The result ensures the Waratahs go into the three-week Test window on top of the Australian conference, and second on the overall standings, while the Chiefs' title defence looks increasingly shaky if not moribund given they face three derby dogfights against the Highlanders, the Hurricanes and the Blues once they return to action after the break. The Chiefs improved on their effort of last week, when thumped 45-8 by the Hurricanes, but they were still distinctly second-best against Australian opponents who won the physical exchanges and were more fluent on attack. Aaron Cruden looked uncomfortable in his first start for eight weeks since breaking his thumb. He kicked seven points but the Chiefs' backline, unsettled all season due to injury and rotation, was disjointed as they slumped to a fifth loss. The Chiefs will probably need to beat the Highlanders, Hurricanes and Blues when the competition resumes if they are to finish in the top six. Waratahs coach Michael Cheika, meanwhile, believes the result, and the manner in which it was achieved, suggests his once-flaky side has turned a significant corner. "Dave Dennis before he scored that try, he's got seriously one of the worst cuts I've ever seen on a footy field," Cheika said. "On the top of his leg - it's a massive one. And he strapped himself up because we had no other back-rower reserves left. He got himself up and then ended up running 30 metres to score that try, and that pretty much sums it up. "[Tatafu] Polota-Nau lost his two front teeth at the start of the game and punched his way through until the end, and that's the type of thing I really like to see in a team. "We just stuck to our guns and got the result. And against a team like the Chiefs that's a really rewarding outcome for us." Ashley-Cooper also appeared to fight on with an injury, and Michael Hooper was pole-axed in the first half by Chiefs prop Ben Tameifuna in a contender for hit of the year, only to spring straight to his feet. "He was hurting and he got straight back in the line because you need everyone," Cheika said. "The scoreline doesn't represent how tight the game was, and we needed all hands on deck all the time, so there was really no opportunities for anyone to stay down."